We’re all familiar with Goldilocks and the three bears. The little girl enters a vacated home and begins to look for things that fit her tastes. She finds the dinner table set for a family of three. She decides she’s hungry and begins to partake in a meal not prepared for her. She finds one bowl of porridge too hot, one bowl of porridge too cold, and the final bowl of porridge just right. Once her appetite was satisfied, she begins to explore the home. During her exploration she finds chairs and beds, too big, too small, too hard, too soft, and just right. You know the rest. Though I am a big proponent for designing worship that is relevant to the culture, I am tempted to ask myself if the pursuit of relevancy carries the risk of feeding the self-centered ego of human nature. Have we raised up a group of Goldilocks worshippers in Christ’s church? Do our worshippers enter the house looking for their tastes and desires to be satisfied? In some versions of the little story, Goldilocks was chased from the home of the bears. 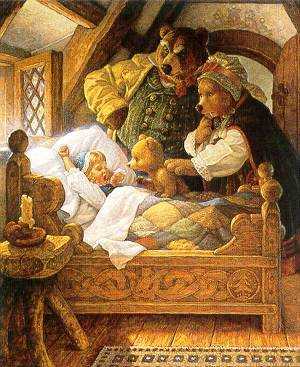 In other versions, Goldilocks was eaten by the bears. In either case, the bears were angry to have found their premises and possessions used for selfish reasons. I have to wonder if we ever tire of leading lives that produce little else than empty porridge bowls, used chairs, and unmade beds rather than lives that display love, joy, peace, patience, kindness, goodness, faithfulness, gentleness, self-control?